My family loves Biscuits & Gravy for brunch. It doesn’t get much better than combining those flavors with eggs and cheese as far as I’m concerned. 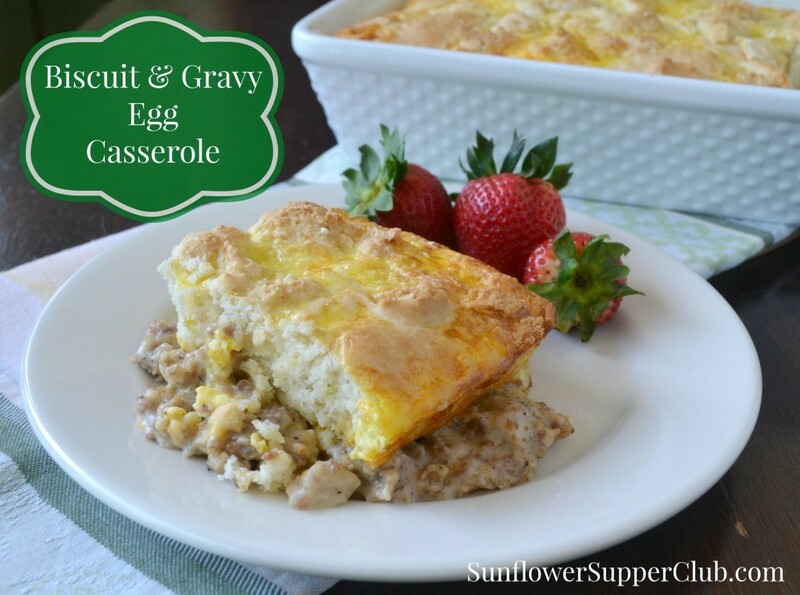 Earlier on the blog I shared another Sausage, Egg and Biscuit Casserole my family enjoys. While delicious, that casserole requires you to make the gravy on the stovetop before serving. I decided to play with that recipe and see if I could figure out a way to eliminate the need to do that. I wanted to be able to serve the dish right out of the oven without any other steps. It makes serving brunch even easier! Brown the sausage in a skillet over medium high until no longer pink and cooked through. Turn the heat to low, sprinkle the flour and stir to coat the browned sausage. Cook for 1-2 minutes. Slowly pour in 2 cups of milk and cook over low heat until thickened. Remove from the heat. Stir the hot sauce, ground sage, kosher salt and pepper into the sausage gravy. Pour the sausage gravy in the bottom of a greased 2 quart casserole dish. Evenly spread the shredded cheese over the gravy. In a small bowl, beat the eggs and ¼ cup milk until well combined. Evenly pour over the cheese in the casserole dish. In a medium bowl, combine the Bisquick and the remaining 1 cup milk. Using 2 spoons drop spoonfuls of the batter evenly over the top of the casserole. Bake uncovered for 40-45 minutes until eggs are set and topping is lightly browned. Oh you smarty pants! =) Looks amazing…my hubby would LOVE this. Pinning! My family would love this! I will have to remember it for our next get together! Is it a must for the hot sauce? i can’t eat anything with hot sauce in it. sound so good, want to make this. My late mother-in-law was from the hills of Kentucky and made the best sausage gravy ever! Luckily, she taught me how to make it as well and it is a favorite of her boys and mine! That said, I have never heard of putting hot sauce in the gravy, and the Kentucky boys say “no way”! She did, however, add a little bit of sugar to the gravy. Love it Roberta! I like the idea of adding a little bit of sugar, we’ll have to try that. Thanks for visiting! Thanks i will add a little suger instead of the hot sauce. can’t wait to try this in the morning. We just love hot sauce and put it in a lot of different dishes. It does not make the dish “hot” if that is what you are worried about. Frank’s brand is fairly mild. If I left the hot sauce out I would probably add a little more pepper. It should be delicious either way. Let me know how it turns out if you try it! I’m wondering how this would work assembled the night ahead. Have you tried that? Hello Mary. I actually have not tried putting it together the night before. I have seen other recipes similar in which they do say you can do that. I plan on trying it soon. If you try it let me know how it works for you. Thanks so much for visiting us! 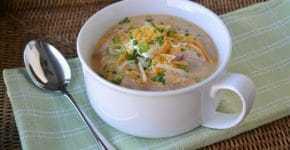 Your recipe is featured at Full Plate Thursday and my Face Book page. Hope you are having a great day and enjoy your new Red Plate! Thanks so much Miz Helen! We really appreciate it! My family would love this for brunch this weekend! I so can not wait to make this! Let us know if you try it Christine. Thanks so much for stopping by! This southern girl loves hot sauce! Must be Texas Pete though. I add it to many dishes….you could also spice it up with some spicy/hot sausage. I will be trying this recipe very soon.